“Skål” translates to “cheers” in Danish, Swedish and Norwegian. And soon it will refer to Ballard’s Viking mead hall, a place that nods to the neighborhood’s Nordic heritage. Skål Beer Hall, 5429 Ballard Ave. N.W., is currently under construction. The restaurant and bar will be located in the space formerly operated as People’s Pub. Adam McQueen had the vision for the place, part Viking butcher shop, part modern bar. His Norwegian and Swedish heritage prompted him to move to Ballard about four years ago. He spent the past eight years in the craft beer industry. “It made sense to marry my beer knowledge with my pride for my heritage,” he said. McQueen wanted to create a space where Ballardites and their guests could gather over food and drink in a comfortable setting. When the People’s Pub became available, McQueen jumped at the opportunity, knowing that the space needed to be gutted and completely remodeled. The goal was to open up the interior and create a showcase of the kitchen, where meats will be grilled and sharable plates prepared. Think Viking tapas, simple, traditional recipes that pair well with aquavit, mead and Norwegian beer. Intimate booths are placed next to long, sharing tables, for 10 people or more. “It’s our nod to the traditional beer hall,” McQueen said. It’s also part of his mission to connect diners and drinkers. He’ll have a giant stone fireplace, which will become a focal point for the space, as well as shuffleboard tables for those who enjoy a game. The bar menu will include local craft beer and imported selections, regional wine, mead, cider and specialty cocktails. Check the kitchen for specials featuring goose, venison and game. There will be smoked salmon boards, house-made sausage and seafood skewers. The restaurant sill has “Beerhalla memberships” available as part of its Indiegogo fundraising campaign. McQueen hopes to open in the fall–and to eventually host events and classes in the space, focused on history, food and culture. 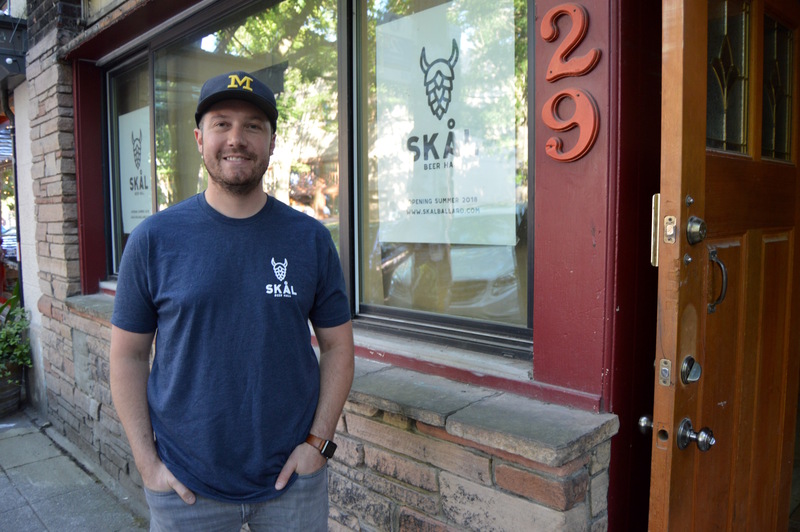 Megan Knight, a member of Ballard’s Leif Erikson Lodge, Sons of Norway Seattle, looks forward to seeing Skål’s doors open. Knight said that McQueen has reached out to the Nordic community and wants to help it thrive in Ballard. For more information, visit www.skalballard.com. To become a member, go to www.indiegogo.com/projects/skal-beer-hall-restaurant. To learn more about the Leif Erikson Lodge, Sons of Norway Seattle, visit www.leiferiksonlodge.org.